Mons. Corrado Lorefice receives Raoul Wallenberg Medal. 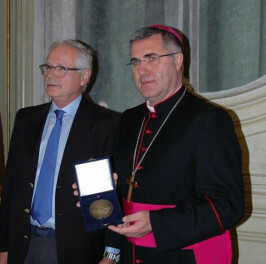 Yesterday, June 29, at the archiepiscopal palace in Palermo, Archbishop Corrado Lorefice received the Raoul Wallenberg medal. At the beginning of this year, on January 12, 2017, Archbishop Lorefice announced to the local Jewish community that the Oratory of Saint Mary of the Sabbath would cease to function, so that the ancient Synagogue of Palermo may once again be inaugurated at the location. The date of the announcement wasn’t random: January 12, 1493—524 years earlier—was the deadline dictated by the Catholic King Ferdinand of Aragon, husband of Isabella of Castile, for Jews to leave Sicily. In that context, the Catholic church in Palermo confiscated the Great Synagogue of the city, and built on its ruins the church of Saint Nicholas of Tolentino and the Oratory of Saint Mary of the Sabbath. The free loan of the property, now being implemented, was arranged with the collaboration of the UCEI (Union of Jewish Communities of Italy, for its abbreviation in Italian), and local representatives including Evelyne Aouate, president of the Sicilian Institute of Jewish Studies, and the emissary of Shavei Israel (a non-governmental organization), Rabbi Pinhas Pierpaolo Punturello. This is the first time that the Wallenberg Foundation grants such a high distinction to a representative of the Catholic Church. It should be noted that one of the most important of the Wallenberg Foundation’s programs, “Houses of Life,” is characterized by a strong element of interreligious dialogue. This initiative, launched in 2014, seeks to identify and acknowledge, by means of commemorative plaques, locations in Europe that offered refuge to the victims of Nazism, who were mostly children left behind by their parents before the latter were deported to death camps. In the less than 3 years since it was instituted, more than five hundred “Houses of Life” have been identified in Italy, France, Belgium, Poland, Hungary, Holland, Denmark and Greece. Among these “Houses of Life,” there is a preponderant proportion of churches, monasteries, convents, and religious schools belonging to the Catholic Church.